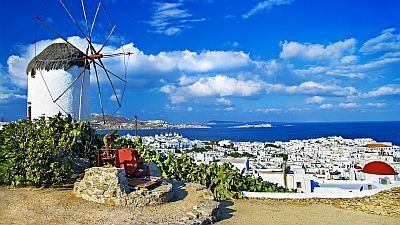 In Mykonos, a small Greek island in the group of the Cyclades, the climate is Mediterranean, with mild and rainy winters and warm and sunny summers. 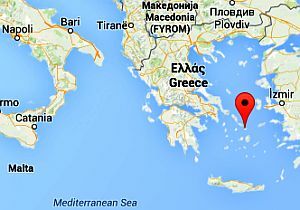 The island is windy, and for this reason it's cooler in summer than other islands of Greece. The wind has been exploited for centuries by windmills, which are found all over the island. Rainfall follows the Mediterranean pattern, in fact it is concentrated from October to March and is not abundant, since it amounts to about 500 millimeters (20 inches) per year, and this is confirmed by the landscape, which is arid. Winter, from December to mid-March, is mild, quite rainy and windy. The wind, frequent and sometimes violent, makes the air feel colder than it actually is. 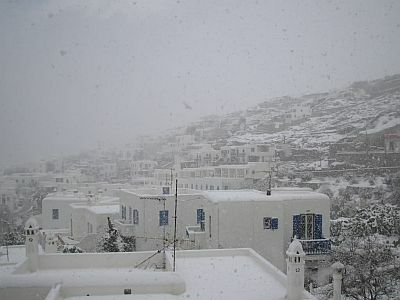 The island is located north enough and close enough to the mainland, to receive cold air with some frequency, to the point that there can be cold days, with highs below 10 °C (50 °F), and sometimes even snow can fall. Spring, from mid-March to May, is mild and quite sunny, with periods of bad weather and rain which gradually become more rare, but it is often windy. By mid-May, the Meltemi begins to blow, a persistent wind, cool and dry, blowing from the north for a few days in a row, especially in the daytime, but sometimes even at night. Summer, from June to mid-September, is warm and sunny, but also windy. The Meltemi blows for long periods, especially in July and August, and it's stronger in the afternoon but can insist also in the evening. In some cases, wind gusts may exceed 70 kph (45 mph). Thanks to this wind, the maximum temperature is usually below 30 °C (86 °F), and even in the hottest periods, when in other parts of Greece the temperature can reach or exceed 40 °C (104 °F), here it does not exceed 34/35 °C (93/95 °F). Autumn, from mid-September to November, is initially warm and sunny, but it gradually becomes cooler and rainier. Autumn too is windy: as long as the weather is nice, the Meltemi still blows, while later the wind blows when Atlantic depressions pass over the area. The amount of sunshine in Mykonos is great in the summer, when clear skies prevail, while it's not high from November to February, when the sky is often cloudy, although sunny days may occur also in winter. The temperature of the sea is never very high because the wind blowing in summer keeps it a bit low, however, it reaches 23 °C (73 °F) from July to September; in June, it's still a bit cool, about 21 °C (70 °F). The best time to go to Mykonos for a beach holiday is the summer, between June and mid-September. It's advisable to bring a sweatshirt for cool evenings, which occur mainly in June, but given the intensity of the wind, those who are sensitive to cold may feel a little cool even in July and August. If you want to visit cities or to go hiking and walking, the spring is also good, in April and May, but since it almost never gets hot, usually you can stroll around the island in summer as well, which normally we do not recommend in Mediterranean climates, and generally in places where in summer it can get hot.